While much is known about the status of Afghan refugees in Pakistan and Iran, the two largest host countries to the Afghan diaspora, little is known about those in neighbouring Tajikistan, where some 3,000 currently reside. Ask them what they want though the answer will most likely be the same. "I don't want to return to Afghanistan. 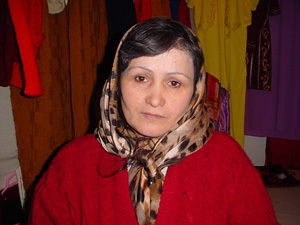 I want to be resettled," Rahima Sakhidod, a 38-year-old, told IRIN in the Tajik capital, Dushanbe. "There is no future for me here." Arriving from the northern Afghan city of Konduz 12 years ago following the death of her husband, she yearns to begin a new life outside of Tajikistan, preferably in North America or Western Europe. "I don't care where I'm resettled," the mother-of-four said matter-of-factly. "I just want to go to a country where I can educate my children." Her friend Qudisay Mohammad Naim agreed. "If I had wanted to return to Afghanistan, I would have gone already," the mother-of-five from the northern city of Mazar-e Sharif concurred. "We have enemies there. It's not safe for me or my family," the 34-year-old told IRIN, who fled to Tajikistan during the Afghan presidency of Mohammed Najibullah. Most Afghans arrived in the mountainous Central Asian state of 6.5 million in the early to mid 1990s, after the fall of the Najibullah regime, while a good number came after the Taliban took over. According to the office of the United Nations High Commissioner for Refugees (UNHCR), many of these individuals had been processed and had refugee status, though there were some persons whose status had yet to be confirmed, and who consequently were referred to as asylum seekers. And while more than 2.5 million Afghan refugees have returned to Afghanistan from neighbouring countries since the collapse of the Taliban government in late 2001, the chances of seeing any sizeable return from Tajikistan, which shares over 1,200 km of common frontier with the beleaguered nation, remains minimal. Their status in the impoverished nation is actually better than most Afghans living elsewhere. "In many ways they feel at home here," Nicholas Coussidis, representative for UNHCR in Tajiksitan told IRIN in Dushanbe. And with the vast majority of them being of Tajik ethnicity, it's not hard to understand why. "There is definitely an informal integration of Afghans taking place, much more common as found in Pakistan and Iran," the UNHCR official explained, noting many were in mixed marriages, worked or had businesses, while some of their children attended local schools. But that has not always been the case, with reported incidents of discrimination, particularly when it came to employment, as well as cases of detentions and deportations due to expired documentation. "There was no proper status determination procedure. There was not very positive refugee legislation," Coussidis explained. That attitude has changed immensely, however, over recent years, a fact Coussidis was quick to point out. "This negative protection climate has changed," he stressed, adding authorities in the former Soviet republic had understood the issue, noting any unnecessary hard line failed to serve any one's purpose. "From the very top to our counterparts in the Ministry of Labour and state migration services, the authorities have a very positive outlook and attitude towards Afghans - not just because they are the majority [of the refugee community] - but all other asylum seekers as well." But challenges still remain. Mavjuda Rakhmanova, the director of the Dushanbe-based Refugee Children and Vulnerable Citizens (RCVC), a local Tajik NGO working to assist refugees and asylum seekers, cited legislation, current registration procedures, jobs and housing, as the main problems Afghans had in Tajikistan now. "The main problem Afghans face in Tajikistan today is the current legislation. This should be changed in accordance to international norms and standards," she revealed. [Tajikistan] Mavjuda Rakhmanova, the director of the Dushanbe-based Refugee Children and Vulnerable Citizens (RCVC). Citing resolution 325 restricting the residency of asylum seekers in Tajikistan, she noted that Afghans were prohibited to reside in some 15 cities and towns in Tajikistan, including the capital and Khujand. "This is for asylum seekers who came to Tajikistan after 2000," Rakhmanova said, noting those coming after 2000 were to be settled in rural areas only. 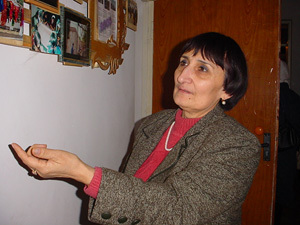 And while refugees had the same rights as Tajik citizens to work, once an employer learnt they were Afghan, they were not keen to offer them jobs, the NGO worker told IRIN, noting the problem of employment was particularly profound amongst women, many of whom traditionally would not work if they were in Afghanistan. According to the UNHCR, they were now in the process of amending the current refugee legislation to reflect the 1951 Convention and international instruments, while at the same time, efforts were now under way with the authorities for finding solutions, starting with the registration revalidation and updating activity, status reviewals, and documents being extended accordingly. "By doing this, we can determine who is in the need of protection, and who is not," Coussidis said. Describing the current atmosphere as good, he remarked: "The protection climate and the overall attitude of the authorities is very positive. We have gone beyond dialogue and really have a constructive process with the authorities." There are currently some 3,000 refugees and asylum seekers in Tajikistan today, almost all of whom are Afghans, along with a small handful of Iraqis, Iranians and Uighurs. "The registration revalidation and updating activity is not just for the Afghans, but for any refugee or asylum seeker in the country, irrespective of their place of origin," the UNHCR official said. Set to begin in February 2004, the hope is to have a complete profile of refugees and asylum seekers in Tajikistan as much as possible. "This is our policy - in full support and collaboration with the authorities," he noted. At present, the vast majority of Afghan refugees live in Dushanbe, as well as a small amount - approximately 250 -living in the northern city Khujand, where economic conditions in the impoverished nation are somewhat better than rural areas. "For refugees, life is more secure in the cities," RCVC's Rakhmanova added. This unto itself undoubtedly plays a role in impacting their decision to return to Afghanistan. A largely urban caseload, most Afghans living in Tajikistan come from a middle-class, professional background, ie traders and merchants. "We don't have the more traditional type Afghan refugee that you find in Pakistan and Iran -the farmer and the peasant," Coussidis said, noting most today would get by mainly in small trade. [Tajikistan] An Afghan woman in Dushanbe. Citing insecurity, along with political and economic uncertainty, he noted, despite offering the same assistance package to returning Afghans from Pakistan and Iran, returns right now were not something they expected in large numbers. In 2003, 143 Afghans from Tajikistan returned to their homeland with UNHCR assistance. "Once they are back in Afghanistan, they receive a small monetary grant to facilitate their return to their place of origin," he said, emphasising that the repatriation package Afghans in Tajikistan receive is exactly the same as those returning from other countries. "It’s a standardised process." But for most Afghans interviewed by IRIN, the decision to return to their homeland looks remote. Most seek resettlement or to simply staying where they are. Many of them think moving to America, Canada or Europe would provide solutions, but resettlement was first and foremost a protection tool, Katja Storch, a protection officer for UNHCR in Dushanbe, told IRIN. Meanwhile, many Afghans, like Rahima Sakhidod and Qudisay Mohammad Naim, continue to worry what fate might befall them if they returned given their family's connection to former Afghan president Mohammed Najibullah. "We have enemies there. It's not safe for me," Sakhidod exclaimed. But while the current government in Afghanistan is unlikely to have anything against them, their fears are more on a personal basis, as opposed to an institutional one, perhaps in the form of old vendettas. Such concerns, however, only serve to support the need to find more durable solutions to the Afghan caseload of Tajikistan. "We need to look at other solutions," Coussidis maintained, including the possibility of resettlement for those who really deserve it, including the usual criteria of security, single headed households, health related issues and protection concerns. Still another solution is local integration. "This is not an easy one for a number of reasons, but this is something we are looking into," he ascertained. "It's not an overnight issue," he said, adding it was a small number with a potential to contribute quite a lot to Tajik society.